The latest drought survey map for Massachusetts, as of April 6, 2017. "Now that the short-term portion of the drought is virtually gone, this should help in replenishing some of the longer term deficits, groundwater and so forth," Artusa said. 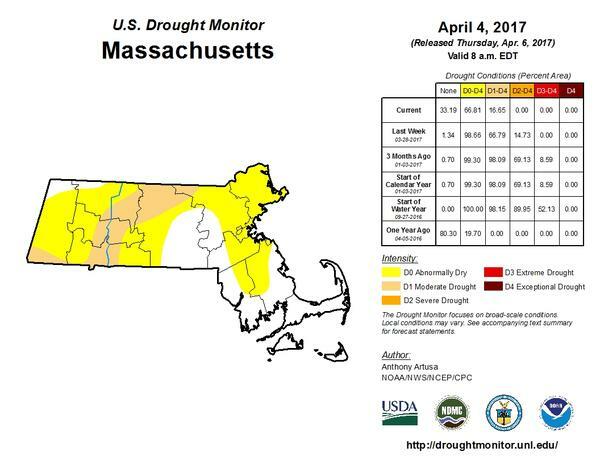 While there's been some improvement in Connecticut, the north-central part of the state is still under a moderate to severe drought. Copyright 2017 WFCR-FM. To see more, visit WFCR-FM.